Wilbur Ross is sworn-in as Commerce Secretary in the Eisenhower Executive Office Building in Washington, Feb. 28, 2017. 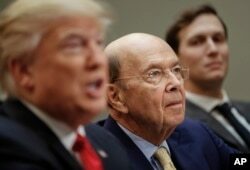 U.S. Commerce Secretary Wilbur Ross said on Wednesday that substantial negotiations to revamp the North American Free Trade Agreement likely will not get started until the latter part of this year and could take a year to complete. Ross, speaking to Bloomberg Television, said U.S. legal notification requirements with partners Mexico and Canada create some built-in delays to the start of substantial discussions. “You're talking probably the latter part of this year before the real negotiations get underway,” Ross said. The 79-year-old billionaire investor, who was sworn into his job just last week, said he hoped the renegotiations could be completed within a year, but it was unclear how long it would take to see benefits like a smaller U.S. trade deficit with Mexico. He said the NAFTA renegotiation would be “complex,” with more than 20 chapters in the 23-year-old agreement that needed to be modernized, along with new chapters such as those covering the digital economy and other sectors that did not exist in the early 1990s. Without a U.S. Trade Representative in office, Ross is taking the lead on trade negotiation issues in the early weeks of the Trump administration. Ildefonso Guajardo Villarreal, Mexico's Secretary of the Economy, speaks at the Economic Club of Detroit, March 3, 2017. 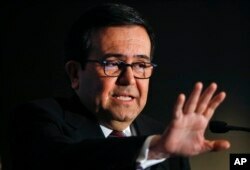 In Detroit last week, Mexican economy minister Ildefonso Guajardo said he was hopeful that Mexico, Canada and the United States could begin discussions in June to “modernize” NAFTA, stressing that Mexico would not accept tariffs. A less belligerent U.S. tone towards Mexican trade in recent weeks has lifted the Mexican peso from historic lows of about 22 to the dollar in January to about 19.6. But Ross said on Wednesday that Mexico would have to make some concessions to the United States. Commerce Secretary Wilbur Ross, center, listens to President Donald Trump during a meeting with House and Senate legislators in the Roosevelt Room of the White House, Feb. 2, 2017. President Donald Trump during his election campaign threatened to slap 35 percent tariffs on Mexican imports. He is studying a House Republican proposal for a border tax adjustment system that would levy a 20 percent tax on all imports while exempting exports. The plan is partly aimed at offsetting value-added taxes charged on imports by Mexico and many other countries. The new Commerce secretary also said he was not concerned about starting trade wars, because the United States was already fighting one.